On Monday, July 6th, the History of Discovery book club met and discussed Faraday, Maxwell, and the Electromagnetic Field: How Two Men Revolutionized Physics by Nancy Forbes and Basil Mahon. As the title of the book suggests, Faraday, Maxwell , and the Electromagnetic Field are the three main characters of this impressively detailed book. Michael Faraday was the brilliant experimentalist who first came up with the concept of the electromagnetic field. James Clerk Maxwell was the genius theoretician who formulated the laws of electrodynamics and showed that electromagnetism and light were manifestations of the same phenomena. The discovery of Electromagnetic Field has transformed our world. 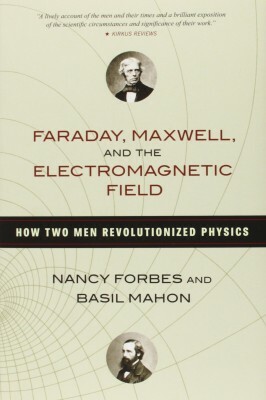 Nancy Forbes and Basil Mahon take the reader through Faraday and Maxwell’s personal and scientific milestones, and discuss the various steps they took while developing their ideas. They do not dwell on the mathematics, but do describe the results summarized in Maxwell’s equations thoroughly before going on to explain what was so revolutionary about the new theory. Accessible and engaging this book provides insight into understanding the importance of field theory and describing the scientific process to a general audience. This entry was posted on Tuesday, July 14th, 2015 at 5:08 pm and is filed under Ada's Events, Book Clubs, Reader Response, Reviews. You can follow any responses to this entry through the RSS 2.0 feed. Both comments and pings are currently closed.